Acebanker helps financial institutions to augment their wealth management business by automating computational intensive tasks such as product recommendation. The core algorithm dissects the profile of each client and crunch zillions of data points to find the most appropriate products for them. Acebanker is a winner of the 2015 Red Herring Award (Asia) and a regional finalist at the inaugural UBS Future of Finance Challenge. Acebanker has its roots in Asia, and has served some of the leading banks in the Asia Pacific region. Since late last year, Acebanker became the only China-based startup to join Fintech Fusion as part of our international expansion plan. 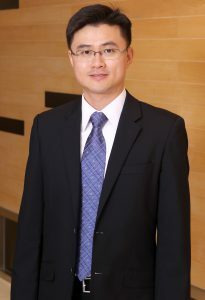 Acebanker was founded by Shin Chuang, a veteran in digital banking. Shin was previously the Head of Digital Banking at Standard Chartered Bank in China. In 2013, he was named as one of “Top 50 Business Innovators in China” for inventing the world’s first lead-capturing ATM, and utilised 47 machines to beat a 500-person human sales team. Shin is a graduate of the University of Bristol in the UK, as well as MIT and the Wharton School in the US. He is married with one daughter. My name is Shin Chuang, I’m the founder and CEO of Acebanker, a fintech startup based in Shanghai, China. Acebanker helps financial institutions automate financial advisory by matching each individual clients with the right financial products that meet their needs. This is done through a bilateral recommendation that uses machine-learning to understand the behaviours and needs of the clients, while incorporating the investment strategies of the firms. 3/ What’s the founding story behind Acebanker? Once, in a span of 6 months, my bank changed my relationship manager four times, for various reasons. I was frustrated each time a new RM was assigned to me, I had to explain to her my financial goals all over again, despite the fact that my risk profile and aspirations had not changed. That prompted me to look outside to shop for a new bank. That was when I realised there were many very good products outside that meet my needs but which my RM weren’t recommending to me. That was when I wished I had a trusted financial advisor who could stay with me long-term, and who understand me and know what I want over time. That idea then gave birth to Acebanker. That got to be when one of my employees turned down a 6-figure salary from Google to work with me for a tiny fraction of that amount. It is a validation to our team unity, as well as the vision of the company. 5/ What’s the vision behind Acebanker? We want to put a digital private banker into the hand of everybody. It’s hard to say, there are so many. Perhaps the biggest challenge is not having enough time to do everything that we want to do.